Start up Cirque Creek, ascending a steep tussock and scrub fan to below a large vertical bluff. Trend right on a long traverse crossing two sculptured watercourses. From here it gets a little tricky; ascend steep tussock directly up until a small terrace leads right to a large snow basin (avoid the temptation to head directly up as the terrain steepens dramatically) then continue traversing right into the centre of the face. Follow easy slopes to the ridge north of the summit. The buttress is approached by sidling down from high on the Original Route. Seven pitches. A ridge and face route on the skyline as seen from Homer Hut, on the rock spur west of the South West Ridge of Christina. There is an easier variant missing the grade 20 pitch: stick to the main chimney crack instead of traversing right. Climb the south side of a prominent gut above Lyttle's Flat and continue up scree and snow slopes to the col just north of the summit. Bill Gordon, Ralph Miller, Dal Ryan, 1957. From the col northeast of the South Pk, climb a snow gully to join the South West Ridge on the right. The first ascent began by climbing the South West Ridge of the South Peak. Climb up the shingle to a waterfall which drops out of a prominent west-facing gut, easily climbed on the north side. Early season avalanche danger from the hanging glacier can be avoided by crossing to slabs on the true right. A steep band is crossed in the central section and the rock deteriorates towards the summit. Murray Jones, Harold Jacobs, Mar 1966. Above Camera Flat cross the river and climb a large fan, going round to the right and up a gully, then across a small spur. Descend to a second gully, moving diagonally right into the big gully which is followed to snowfields and the East Ridge. Drop onto the Marian Face below Pt 1983 and back to the ridge beyond. On first reaching Lake Marian head up directly to the Marian Bluffs. Climb a short scrubby wall right of a small gut, gaining the terraces above. Continue up the grassy slopes and ribs, tending left at the top to avoid rock walls. The travel on these bluffs is made easy by plentiful stout snowgrass. The snow slopes above give simple access to the East Ridge, which is gained well above the East Peak for a straightforward approach to the summit. Up the bluffs and snow directly above Lake Marian to the upper Marian Ridge. From the top of the highest snowgrass slope beyond the lake, climb up and sidle left around a waterfall basin to a gendarme at the foot of the summit snow-slopes. 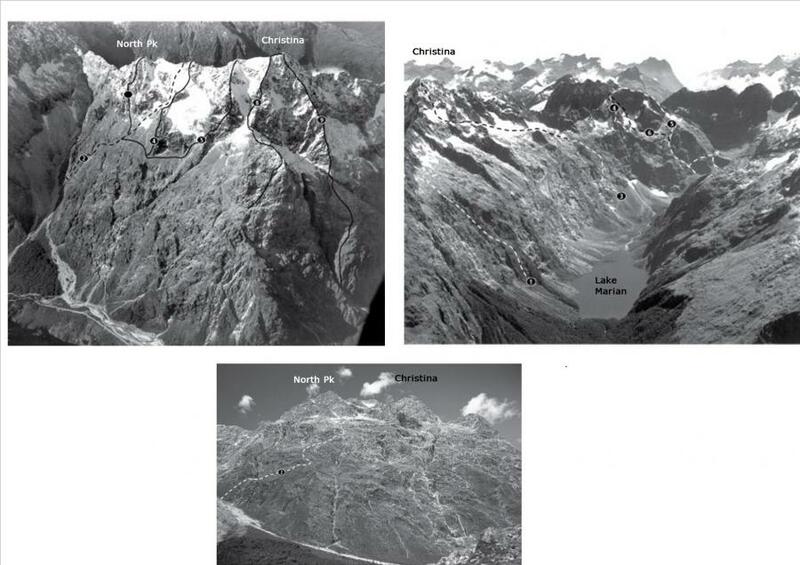 The first ascent party made the first traverse of Mt Christina.